Marabou is a soft webby feather usually located on the belly of the bird. 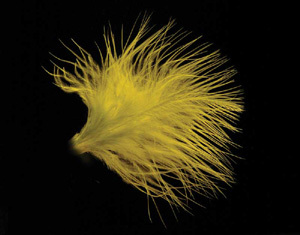 It is an important feather for fly tying but is also a desired feather for the fashion industry in creating boas, for hat plumage, and edge lining of garments. Originally collected from Marabou Storks of Africa, marabou is collected almost exclusively from Turkeys today. The white marabou is dyed to a number of different colors. Barred or Grizzly Marabou is collected from Grizzly Roosters and Chickabou comes from other chickens. Both, in turn, are dyed to a number of colors also. Distributors usually tie the feathers together in a strung line. 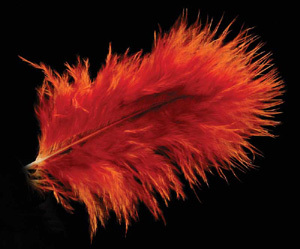 Blood Marabou: A belly feather with medium length barbs and small, thin stems taken from Turkeys, usually 1"-3" long. Barbs tend to be straight with less fluffiness and more even in length. Woolly Bugger Marabou: These are usually Marabou Plumes that have been selected for dense long barbules going up near the tip of the barb. 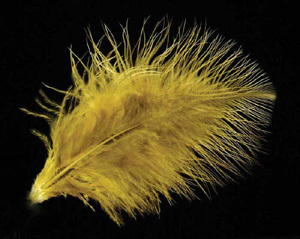 Chickabou (Mini-Marabou): Small marabou feathers taken from hens and roosters along the breast, knees, and thighs. Usually barred and dyed to many different colors. Grizzly Marabou is technically Chickabou taken from a Grizzly Rooster. Finer and more delicate than Turkey Marabou. Particularly useful for Matuku Flies. Hareline : Hareline markets strung Blood Marabou in about 36 colors. They also market Plume marabou as "Extra-select" in 22 colors and smaller plumes called "Mini-Marabou" in 10 colors. Barred (Grizzly) Marabou is available in 10 colors. Wooly Bugger Marabou is available in 23 colors. J. Fair : J. Fair produces an acclaimed marabou in both Grizzly Chickaboo and Premium Marabou in which the marabou is allowed to mature to reach a full barbuled plume. J. Fair also has a number of unique color dyes with 20 different colors. Spirit River: Spirit River produces a strung plume marabou that is excellent for many marabou patterns with barbules up to the tip in 21 dyed colors. 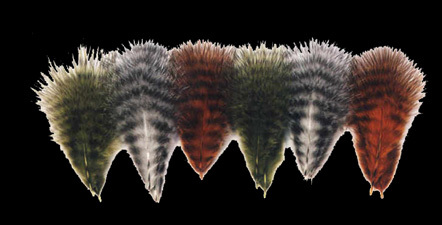 They also have a short Blood Marabou which they call Woolly Bugger marabou with 12 different colors. Their Grizzly Marabou comes in six colors. In 2013, Spirit River introduced their UV2 line of Marabou which has an ultraviolet signature that can be attractive to the fish. The company was sold to Hareline in 2016 and Hareline continues to sell UV2 and Woolly Bugger marabou. Nature's Spirit: Nature's Spirit processes all of it's marabou with preen oil for preservation and additional sheen. They market a plume marabou with 18 colors.count.